Puck Watch: Canucks Trade Options: Doan? With Marco Sturm and the fairly unknown Mark Mancari and Andrew Ebbett being the only additions to the Vancouver Canucks this off-season, speculation is abound that GM Mike Gillis may pull the trigger on a deal to land a top-6 winger, likely a gritty scorer to play alongside Ryan Kesler. The problem for Vancouver at this stage of the year is that everyone likes their chances going into the season. So if the Canucks want to bulk up while only giving away prospects or draft picks, it probably won't be easy. Let's take a look at each division and what options may be available. Philadelphia Flyers - The Flyers have overhauled their lineup. Sure they signed Jagr and Talbot, but they've lost Richards, Carter, and Leino. They don't appear willing to sign Zherdev, so they'll want to hang onto all they can. Also, the Canucks don't have a lot to give that they'd want now that they've signed Ilya Bryzgalov long-term. Pittsburgh Penguins - The Pens don't have a lot to spare. Wingers for Crosby and Malkin are at a premium, so don't expect James Neal or Chris Kunitz to leave any time soon. New York Rangers - The Rangers signed Brad Richards and have a lot of forwards in play right now. They lack depth on the back-end however, so there is a chance a deal could be made here. Keith Ballard reportedly has assurances he won't be dealt, but if he were open to a deal to the Rangers, he and Hodgson or another prospect may be enough to pry a solid forward like Ryan Callahan away. The Rangers have 10 NHL calibre forwards under contract, but also have four solid RFA's (Ryan Callahan, Brandon Dubinsky, Artem Anisimov, and Brian Boyle), and three UFA's (Alexander Frolov, Vaclav Prospal, and Chris Drury). On this list, the best fit for the Canucks would be Callahan, Dubinsky or Drury. The first two are gritty, hard working, and possess some scoring punch. In Drury, the Canucks would land a winner, and someone with some scoring punch and something to prove. New York Islanders - The Isles need to spend about $11 million just to hit the cap floor. A salary like Ballard's may be ideal.Kyle Okposo may be a breakout candidate this year, and would look good alongside Ryan Kesler, but whether the Isles would be willing to part with their young power forward is a different story. Washington Capitals - The Capitals are loading up, not trimming down, there isn't much here that makes sense. Tampa Bay Lightning - The Lightning lost Simon Gagne and Sean Bergenheim. Their focus is on Stamkos - don't expect anything here. Florida Panthers - The Panthers have been spending like crazy this off-season. They seem to be Vancouver's favourite trading partner - so never say never. However, with the Panthers looking to bolster their line-up this year, don't expect them to offload talent to Vancouver. Carolina Hurricanes - Losing Erik Cole hurt. The 'Canes are thinner up front than in years past. Tuomo Ruutu would look great beside Kesler, but don't count on it. Toronto Maple Leafs - The Leafs have their own top-6 troubles. 'Nuff said. Montreal Canadiens - The Habs went out and signed Erik Cole, but they don't have the size or depth to offer anything to Vancouver, even if they wanted to. Ottawa Senators - Hodgson and Schneider both would be valuable to the Sens. But what could the Sens offer in return? Well, Milan Michalek. He's big and speedy but has struggled in Ottawa for two years. A change of pace might be good for him, but his contract is a bit daunting at $4.3million. Boston Bruins - Not much available here, as the Bruins likely have no interest in downgrading, or trading with their Stanley Cup final opponent. Buffalo Sabres - The Sabres are signing every one they can get their hands on, a trade to nab a forward is unlikely. Detroit Red Wings - The Wings won't be in the market to improve the Vancouver Canucks. Chicago Blackhawks - see above - not a chance. St. Louis Blues - David Backes has always been a popular rumour to come to Vancouver. He had a tremendous year for the Blues, and in a season where they'd like to rebound from all the disappointing injuries last year, don't expect them to ship Backes to a conference rival. Columbus Blue Jackets - Columbus will finally have some veteran talent alongside Rick Nash in Jeff Carter. They will want to demonstrate a commitment to winning this year. Don't expect an off-loading of talent early on. Nashville Predators - The Preds are pretty thin up front. After losing Joel Ward, Steve Sullivan, and a handful of others, there isn't much to shop around with here. San Jose Sharks - After losing to the Canucks in the conference finals, trading a scoring forward to Vancouver would be near the bottom of the Sharks' list. But man, Ryan Clowe would look nice beside Kesler. Dallas Stars - A team in flux with the departure of Brad Richards. This will be Jamie Benn's team soon. For now though, Ribeiro, Morrow, Eriksson, and Benn are the best this team has, and none will be on the move. Los Angeles Kings - Dean Lombardi has loaded up this year. Despite losing Wayne Simmonds, Michal Handzus and Alex Ponikarovsky, he's landed Mike Richards and Simon Gagne. When you add in last season's late addition of Dustin Penner, the Kings boast a potent core of forwards with Kopitar and Brown already in place. Don't expect the Kings to do the Canucks any favours, as they'll both be competing for the conference's top spot. Anaheim Ducks - Ryan Getzlaf, Corey Perry, Bobby Ryan. Those three aren't moving, and after that, there isn't really anything you'd want. (Teemu aside). Phoenix Coyotes - Right now, the Coyotes lack offense. Unless captain Shane Doan re-signs during the season, there may be plenty of trade speculation down the stretch if the Coyotes are out of the playoff picture. Doan is an unrestricted free agent at year's end. They lost some of their better players to free agency, so Doan could be on the move. The longtime Coyote would be a perfect winger for Ryan Kesler, and Cody Hodgson or Cory Schneider may very well be pieces the Coyotes would be interested in, as they lack scoring and a bona fide number one netminder. Edmonton Oilers - Division rivals seldom make trades, and the Oilers' young crop of forwards are not going to be on the block. Calgary Flames - Once again, unlikely trading partners. Minnesota Wild - Guillaume Latendresse showed why he was such a high draft pick after being traded by Montreal to Minnesota. However, the Wild lack depth up front (and size) and will want Latendresse to regain his 2010 form. Colorado Avalanche - The Avs looked destined to miss the playoffs this season. Some curious trades robbed them of budding power forward Chris Stewart. The Avs are young and will compete, but there is not a lot of pieces they'd be looking to trade - especially to Vancouver. Well, there you have it. There are not a lot of options out there right now. If you're placing bets, the best option for Vancouver right now would likely be the New York Rangers with their glut of forwards. There are a few that fit the bill of what the Canucks would be in the market for. Aside from the Rangers, the Islanders may be willing to part with Kyle Okposo. Beyond that, the Canucks may be well-suited to wait until later in the year when some teams are out of the running. If the Coyotes are 10 points out of the playoff race by February or March, look for GM Mike Gillis to make a strong push for Shane Doan. Doan would be the perfect linemate for Ryan Kesler. A good skater with defensive awareness, grit, and a keen scoring touch, Doan also is a pending unrestricted free agent who has yet to accomplish anything in the post-season with the Phoenix franchise. Gillis has stated in the past that he wants players who are hungry and have a will to win. 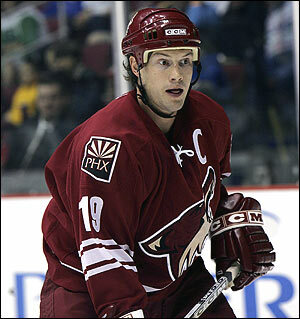 If available, Doan would be perfect.